We all know we want more traffic to our websites, right? That's a common, baseline objective for any website. More traffic should mean more people requesting quotes, etc...? Yes and no. More low quality visitors means less action on your site. More high quality visitors means more action on your site. Our focus is always getting high quality traffic through SEO, Pay-Per-Click and other traffic generating techniques. Although I think many small businesses incorrectly stop at the Attract phase of Inbound Marketing, it's still one of the most important aspects of Inbound Marketing. The role of SEO in Inbound Marketing cannot be understated. 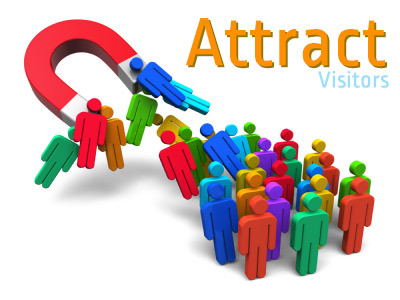 For your site to convert visitors into leads and to nurture leads into closed sales, you first have to have a steady stream of high quality visitors that are looking for an answer to their problem(s), that you provide. How do you think most of your ideal buyers go about finding solutions to their problems? They open a web browser and search in Google. If you answered any other way than that, you are fooling no one but yourself. To have an effective Inbound Marketing strategy, it's vital that you also have an ongoing and concerted SEO effort. The beautiful thing about Inbound Marketing is that you are reaching visitors that want to find the solution you provide. You aren't jumping in front of them saying "Hey! Look at me! Look at me!"! Instead of interrupting them, you are being there when they need you. If they are searching for the solution to their problems, you need to be there in the search results. Paid search is very effective, but SEO is the gift that keeps on giving when done right.